This is an In Person Signed Colour 10" x 7" Reproduction Photo of the former British Boxing Champion. 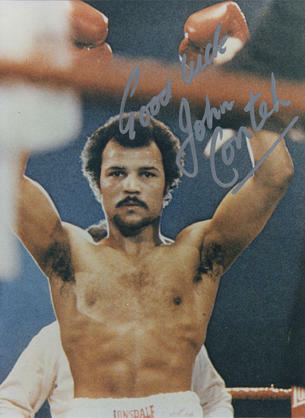 John Conteh (born 27 May 1951 in Kirkby, Liverpool, England) is a British former boxer who was world light-heavyweight boxing champion. Conteh is one of Britain's most successful boxing champions. At his peak in the mid to late 1970s he was considered good enough that he was touted as a possible opponent of Muhammad Ali. He enjoyed great fame in Britain and was often on the front as well as the back pages of the leading dailies due to his love of partying and women. Conteh said that his excessive lifestyle brought about a premature decline in his talents. He started boxing at age 10 at the Kirkby club that was a training ground for some of the best amateur boxers, Joey Singleton, Tucker Hethering and Stuart Morton were only a few. At 19, he won the middleweight gold medal at the 1970 British Commonwealth Games. He won the WBC Light Heavyweight crown in October 1974 by defeating Jorge Ahumada and held the title until 1977 when he was stripped for not going through with a mandated defense. He was the loser in a fifteen round split decision to the Croatian fighter Mate Parlov in an attempt to regain the title. He failed twice in further efforts to win back his old crown in 1979 and then again seven months later in 1980 - both against the American Matthew Saad Muhammad. Muhammad won both bouts but his first victory was declared void because his cornermen used an illegal substance on a cut. He retired from professional boxing in 1980. His professional record is 34 wins, 1 draw, and 4 losses. In 1973, Conteh was one of the celebrities featured dressed in prison gear on the cover of the Wings album Band on the Run.